Airbnb The San Francisco based internet platform is ready to collect the 10% lodging tax on apartment rentals to tourists in exchange for the dropping of the 45 days minimum stay rule. The agreement could bring to an end the long battle between the government, the hotel industry and property owners. 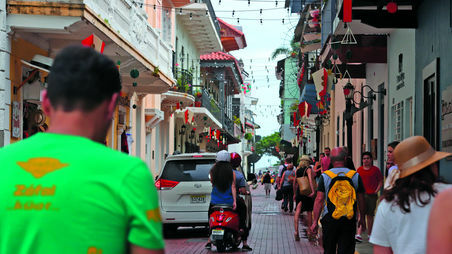 Last year, some 2,200 owners in Panama registered in Airbnb collected $7.2 million through the rental of about 3,800 properties distributed throughout the country reports La Prensa. Shawn Sullivan, Airbnb representative for Central America and the Caribbean, indicated that they are willing to sign an agreement with the Government to collect the lodging tax of 10%, which is also paid by the hotels, but with conditions. Among the requests of the company, which earns 15% of the final value of each rental, is the elimination of Article 21 of Law 80 of 2012, which prohibits the rental of properties to tourists purposes for less than 45 days, as well as the protection of the data of the owners of the properties registered in the platform. Sullivan said that in countries with which they have signed similar agreements tourism has grown between 20% and 30%. that Airbnb must comply with market rules if it wants to operate legally in the country, the main concern of hoteliers is to attract more tourists. Last year 54,000 customers entered the country while in Costa Rica the figure reached 380,000. "Panama has the potential to attract more tourists, but we must increase the promotion, "said Rodriguez. Looks like craigslist is gonna win! Nobody is gonna pay that tax! Panama Is safer, cheaper and easier to travel in than Costa Rica. Crossing the border brings you immediately from the worst roads in the world to some of the best. What you say here is true about the negatives regarding travel or living in Panama, but Costa Rica has its problems too. The 10% charge would still not level the playing field. What about the other costs such as safety and security requirements amongst a myriad other regulations that hotels need to fund. ? All bnb invest in is software and a few computers. Then sit back and rip off 15% with no operating expenses whatsoever. Keep the 45 day rule as a minimum. If you think simply increasing promotion will encourage people to visit here, you're not looking at the whole picture. We recently attended the la Candelaria 10K run in Bugaba. It was well organized and well run, but there was a huge pile of old garbage on the street across from the park, at the start/finish gate of the race. While driving between Boquete and David yesterday, we experienced air tainted with 2 pasture fires, and 2 stinking garbage fires, no doubt complete with plastic bags and styrofoam containers. Potrerillos, a community experiencing great disruption by construction of the Boquete to Volcan highway, has been without water for more than a week. The road crew not only broke the water line, but then allowed it to fill with mud. Most water outages are due simply to the lack of shut off valves. What tourist would consider coming here and riding a bus? The drivers are allowed to use their phones, read the paper, make change, park in the middle of traffic lanes, and speed, with impunity. Busses and/or taxis are involved in more than half of the traffic accidents. The problem for Panama is not in the lack of promotion, it is the lack of respect for what you want to promote, and for the people you want to come here.